There are dozens of ways to raise tomatoes, and they all work. One should hesitate to recommend any one as THE way. The wonderful thing about a tomato is its willingness to grow and bear delicious fruit in spite of everything. Pay no attention to it, and it still produces. No wonder there is many backyards across America with a tomato vine or two. To get extra good tomatoes, though, and an extra lot of them, you should pamper them a bit. Start with the soil. Dig it deeply and mix in a lot of compost or peat moss. Add some fertilizer. Then when the weather has definitely warmed up and the frosts are over, set the plants out. Make the hole big and roomy. Set the plants rather deep in the holes, so the first (seed) leaves are even with the surface of the soil. Water the transplants with a weak solution of liquid fertilizer. Shade the plants lightly if the sun is hot. Then begins the fight with cutworms. Tender young tomato plants fresh from the greenhouse are easy victims of these hungry creatures, which simply chew through the stem at ground level and topple the plant. Mid-spring, when the nights are cool and moist, is when cutworms or army worms (close kin) are most active. A good chemical weapon against these worms is Sevin. A circle of Sevin powder sprinkled around the tomato forms an excellent barrier against the worms. It must be renewed fairly often after rains and cultivation, until the plants are big enough to fend for themselves. Don’t apply chemicals too heavily. Ask yourself… How much of some poisons a plant may absorb from the soil. Our preference before using any chemicals is to use a an organic option like Neem oil as an insecticide. The next thing a tomato needs is mulch. A mulch helps in many ways. It keeps the ground moisture fairly even, for one thing and this keeps fruits growing steadily and reduces the amount of cracking at the stem end. If the plants are not to be staked, the mulch will keep the fruit off the ground. As a result there will not be so many tomatoes damaged by rot. Mulch also keeps the soil temperature fairly constant, favoring the formation of smooth fruits and continuous setting on of new ones. What kind of mulch to use? Peat moss is good… but expensive if a lot is needed. Grass clippings are good; dry them before you put them around the plants or they may mat down and ferment. Decomposed leaves and plant tops from the compost pile are good but only if the plants are staked; compost may grow a crop of weeds, but they are easily pulled. Other possibilities: straw (seed free, if possible) or prairie hay or any other such material. Now about staking. Many gardeners who have lots of room never stake and never prune their tomatoes. They get satisfactory crops. But for the ambitious gardener who wants to get as large a harvest as possible from a small amount of ground, it is necessary to support the plants some way. This has other advantages, too… it keeps the fruits up off the ground so they are clean and free from rot; it makes the tomatoes easier to pick and the vines easier to care for; and if pruning is to be carried out the plants must be staked or you can’t tell what you are doing. There are all kinds of stakes. Some use a single post driven into the ground beside the plant. Some use “ladders”… two posts with rungs between. Where tomatoes will be grown year after year, it may be well to consider a permanent support of fence posts and heavy wire forming a trellis, much as grapes are supported. Each plant is trained upward on a single twine fastened at the bottom, at a middle wire, and at the top. The plant can be made to climb this twine simply by giving it a gentle twist in a clockwise direction around the twine every four or five days as it grows. If you let the plant develop two or three main stems, have each stem going up a separate twine. This “permanent” system may not last long if you allow the soil to wear out under it. Keep it renewed with humus and fertilizer and thorough cultivation. Design your trellis so the wires can be taken down in the fall to permit you to go through with the plow if your “garden” is large. The purpose of pruning tomatoes is to improve the quality and size of the fruits, and to keep the plants within bounds. Pruning turns the growth toward the fruit and flowers… so the plants set larger, better tomatoes. Excessive pruning, though, will greatly reduce the number of tomatoes you harvest, so go easy with the snippers until you strike the right balance. Several factors influence this matter of how much to prune. One is the distance between plants. If they are close together, they should be pruned more. Another is the foliage habit of the variety. If it is a variety of tomato that produces lots of heavy foliage, it may be pruned heavier than a sparse foliage variety. One should leave enough foliage to keep the fruits from cooking on the vine (especially is this true in the hot regions). Plants that are staked are easy to prune. To prune a tomato to one stem, you must remove all side shoots or suckers as they form. Each leaf axil is capable of producing such a side branch—so you see your job is not a small one. To keep ahead you would have to go over the plants daily. 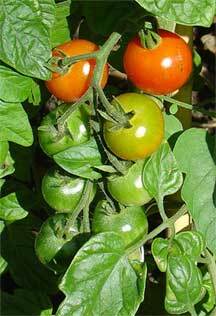 Not many gardeners want one stem tomatoes, for they do not produce enough fruit. If you go over the plants once a week you will be able to keep them down to about three main stems, which is a fair compromise giving a good yield of large fruits. The diagram shows how to sucker a tomato. There is no mystery to this process except to recognize the shoots that are to be removed. Suckers always arise out of the angle between a leaf and the main stem. If they are young and small, snip them off with your thumb nail. lf they are too large for that, use the pruners. Several insect pests affect tomatoes. Several diseases also attack but seldom pose a threat to home gardeners. Early in the season, aphids are a bad pest. Spraying with Malathion or Neem Oil will make quick work of them. Later, when the fruits set on, tomatoes will probably be attacked by tomato fruitworm. Some morning you will discover that a tomato hornworm is in your patch. The leaves will be stripped down to skeletons over a wide area. Finding the worm takes sharp eyes, but keep looking… you’ll find him big as life and munching busily. He looks just like a stem or leaf. Dispatch him by a good heal on the head with your foot. Where blister beetles are bad, they will be found on tomatoes as well as other garden crops. They eat the leaves. Hand picking is the surest way to get rid of them (be sure to wear gloves, though). Or, you can spray with Malathion or Neem oil allowing 5 days before harvesting any tomatoes. Another tomato ailment that often discourages the gardener is blossom drop, or the failure of blossoms to develop fruit. Usually the weather is to blame for this… it’s either too cool or too hot, too wet or too dry. Having a bumper crop is not difficult it just requires some tender loving care… your rewards will be found on the dinner table everyday.